RIMS Notification is out. 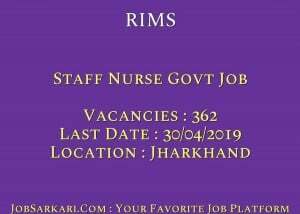 RIMS is recruiting for 362 Staff Nurse Govt Job Posts. You can check RIMS - Rajendra Institute of Medical Sciences last date, download RIMS notification, visit RIMS official website and check other RIMS Vacancy details.Complete Vacancy and recruitment Details about 362 Staff Nurse Govt Job vacancies in RIMS are provided below by JobSarkari.Com only for you. Last Date of Receipt Application Form. 30/04/2019. Mode of Payment. Candidate Need to Pay Application Fee Through Demand Draft in Favour of Director, Rajendra Institute of Medical Sciences, Ranchi Payable At Ranchi. Staff Nurse Grade A. 165. 54. 42. 65. 00. 36. 362. Candidate Must Have Passed B.Sc in Nursing of 4 Years. Having BSc (Post Certificate) or Equivalent Like BSc Nursing (Post Basic) of 2 Years And Must Have Registered With Indian Nursing Council/ State Nursing Council. Age Relaxation. 3 Years For BC, 4 Years For UR/ BC Female, 5 Years For SC/ ST And 10 Years For PH. 3. Candidate Need to Attach Bio Data And All Mandatory Documents With Application Form. 4. Candidate Need to Go On Given Address On or Before 30th April 2019. Q. What is the Last Date For RIMS Staff Nurse Govt Job Vacancy ? A. 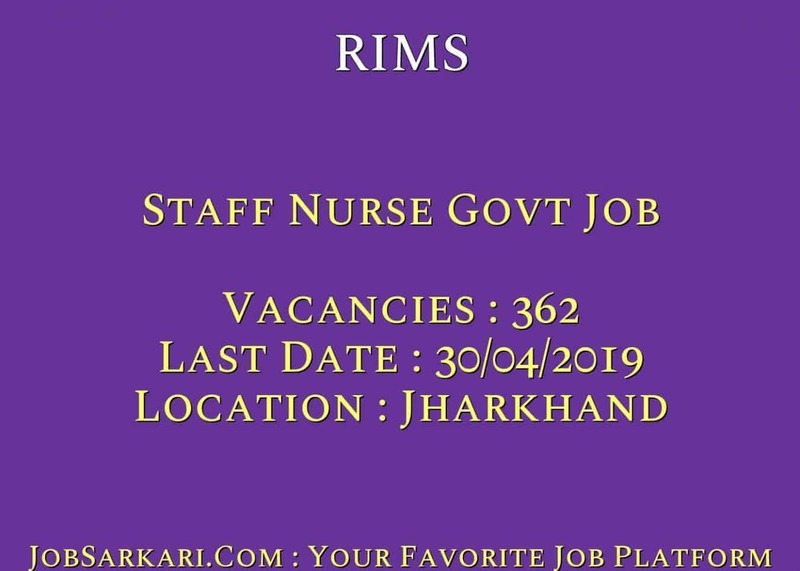 Last Date for RIMS Staff Nurse Govt Job Posts is 30/04/2019. Q. What is the Form Type of RIMS Staff Nurse Govt Job Recruitment ? A. The Form Type for RIMS Staff Nurse Govt Job Posts is Offline. Q. How many vacancies are available in Rajendra Institute of Medical Sciences Staff Nurse Govt Job Posts ? A. There are about 400 Vacancies in Rajendra Institute of Medical Sciences Staff Nurse Govt Job Posts. Q. What is the Full Form of RIMS ? A. Full Form of RIMS is Rajendra Institute of Medical Sciences .